Facebook wants to get into your home. 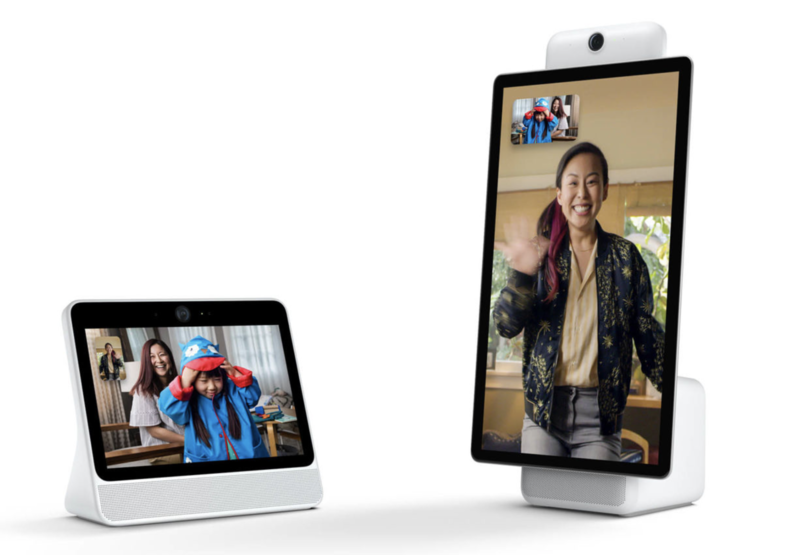 In what smacks of slightly desperate “us-also-ism,” Facebook this week launched its Portal and Portal Plus hardware devices. The big question for consumers, after years of Facebook missteps on privacy, is whether you should let the Portal inside your door. I’d suggest maybe not. The devices come with 10- or 15-inch screens, and retail for $199 or $349. Expect a big ad blitz this holiday season. And given the devices’ functions, form factor and price, you can be forgiven if the Portals seem a lot like Amazon‘s Echo Show. With the Portal, Facebook is trying to stake out space, any space, in the Internet of Things, where Amazon has grabbed an early and significant lead. Every week, you can find announcements for new gadgets from many makers that are controlled by Amazon’s voice-activated digital assistant Alexa. Not incidentally, that list includes Facebook’s new Portals. Given Facebook’s many past problems and the Portals’ modest capabilities (video chat built on Facebook Messenger, with a camera that tracks you as you talk, along with apps such as Pandora and Spotify, plus the formidable Alexa), the devices generate plenty of questions. Facebook tries to answer (or head off) some of those questions on its standalone website for Portal, highlighting the devices’ safety, security, and privacy. They even come with a built-in lens cover if you don’t want that creepy camera following you around the room when you’re not using it. Hardware sales aren’t the future of Facebook. More ads are. So what does that say about what its hardware will do? But this is Facebook we’re talking about. It makes money targeting ads to people based on highly detailed information they allow it to harvest. Hardware sales will almost certainly never be a material portion of the company’s revenues, and thus, never among its priorities. And why is a Portal better than some theoretical device that can video chat through Skype, Apple Messages, Facebook Messenger, WeChat, WhatsApp, and more; track your position anywhere in the world, not just in a single room; use millions more apps than just Pandora and Spotify; and access not just Alexa but other digital assistants? You know, a device like the smartphone you already carry all day long. I suspect the real use case here is what I’ll indelicately call Grandma’s Video Phone. Facebook is already overrun with Grandma and all the other “olds,” a problem for the site’s long-term demographics as youths turn to YouTube, Instagram, and Snapchat. Offering that older audience a stationary video-chat device that’s supposedly simple to operate should indeed appeal to tech-challenged grandparents who want to see their progeny in a new-fangled way. But it’s hard to see this making a dent in the much bigger race for control of our living rooms that Amazon, Alphabet, and Apple have already been running, part of their turn to the physical world for new growth opportunities. Amazon, Alphabet, and Apple already have a huge head start. Digital commerce king Amazon has, of course, been a big part of the bricks-and-mortar world for a while. Amazon’s biggest such move came last year, when it bought Whole Foods for nearly $14 billion. But it also has convenience stores, bookstores, mall pop-ups, package pick-up locations, even a new Manhattan outlet featuring trending or highly rated products that it’s calling Amazon 4-Star. Just this week, I ran across yet another real-world Amazon venture, AWS Loft co-working spaces, available to anyone with an account through Amazon’s cloud-computing division. The company also now sells a huge array of products from “house brands” such as AmazonBasics. All that brick-and-mortar stuff adds up, too: Amazon reported $4.3 billion in sales though its physical outlets in second-quarter sales. The Internet of Things is going to be a very big deal, generating gazongabytes (Editor’s Note: not a real unit of measurement, but still, huge) of data about everything in your house and your life. If that sounds like a steroid-fueled version of what Facebook has been collecting, and misusing, from your phone and computer for years now, you’d be right. At the recent Mobile World Congress Americas conference in Los Angeles, for instance, I toured a Samsung smart-home display that tied together a refrigerator with a computer screen in its door with a controller tablet, smartphone, lighting, thermostat, music playback, security, TV, and much else. Samsung also has its own artificial-intelligence assistant, Bixby, to control everything. Google too is far along in this battle, so much so that a day after the Portal announcement, it rolled out its own somewhat similar device, the $149 Home Hub, with a 7-inch screen and Google Assistant, along with a third generation of its Pixel phone and a hybrid PC/tablet. Unlike the Echo Show and the Portal, the Home Hub doesn’t have a camera, which may be a feature rather than a bug. After all, on the same day the Home Hub came out, Alphabet said it was shutting Google+ after the also-ran social-media platform didn’t tell anyone about a notable security breach months ago. Google is far enough along in its gadget building that it has been sharply discounting, even giving away in bundles, its last generation of smart speakers to grab market share from Amazon. Google parent Alphabet also owns IOT device makers such as Nest Labs, which makes smart thermostats. And trillion-dollar Apple, which has had some notable success building hardware, has the HomePod smart speaker that debuted earlier this year, along with its HomeKit IOT platform and Siri, to which it has begun devoting more money and resources. Is it too soon to let Facebook into your living room? Facebook has yet to launch a public-facing AI assistant to compete with Alexa, Bixby, Google and Siri, though it’s spending billions of dollars on research, and using it for behind-the-scenes tasks such as content screening and facial recognition in photos. Facebook may indeed launch such a service soon, and in the meantime, sell a substantial number of Portals this holiday, probably for use by that older demographic. We’ll see. But given all the serious mistakes of omission and commission that Facebook made in handling all the data it already has been collecting from us, it’s hard to say Mark Zuckerberg and Facebook have earned back the right to vacuum up even more material about our lives, from an even more intrusive device in our living room or kitchen. As the comics like to say, too soon? Yes. Too soon.